It’s a fascinating topic for a fascinating era, one that spawned such giants as William Shakespeare and Christopher Marlowe and enriched our language and culture to such an extent that we still talk about them and read their works over 500 years later. Back in the sixteenth century all players had to belong to companies and companies had to have the patronage of a nobleman, effectively becoming his servant, otherwise all the players within the company could be arrested for vagrancy. The nobleman didn’t pay them and they may be summoned by him to perform privately for his guests. 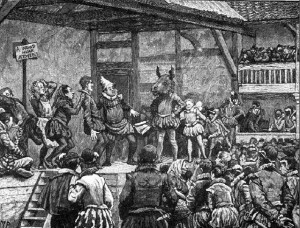 The main troupes of the Elizabethan period were The Earl of Leicester’s Men, The Queen’s Men, Lord Strange’s Men, The Lord Chamberlain’s Men and the Admiral’s Men. Generally speaking, theatre companies consisted of a few sharers, the leading members of the company who bought a share of it. Their investment funds would buy costumes, pay for travelling expenses, writers, licenses and the wages of hired players. In addition to the sharers and lead actors, there would be a few (perhaps 3) hired actors to play minor roles, some boy apprentices, a bookholder, playwright, stagekeepers, assistants to the stagekeepers, a tiring house manager and an overall manager who would be one of the sharers. All plays start with a playwright. 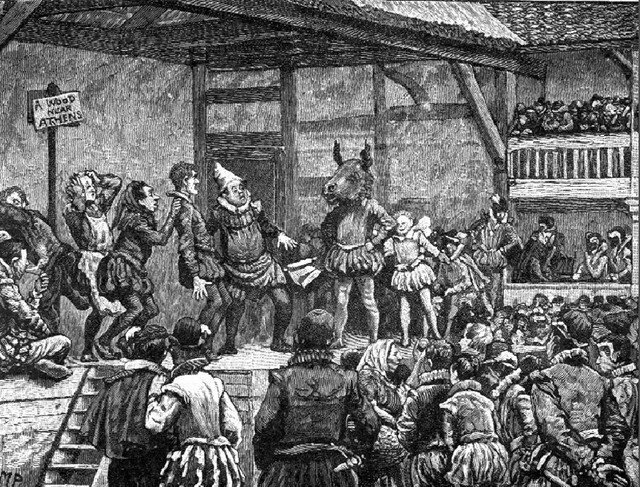 There was no copyright law in Elizabethan England and a play once sold to a company became the property of that company. The going rate for a play was 6 pounds. Sometimes they could enter into other agreements with the company manager, for example they might take half of the second day’s takings. (They’d want to be sure their play was good enough – an unpopular play rarely made it beyond one performance.) Playwrights could be contracted to a single company or they could offer plays to different companies if uncontracted. See below for some snippets about plays. The Bookkeeper or bookholder is the person who held the only complete copy of the play. He stood backstage or in the wings and ensured actors were out on stage when they should be, and that music and props were on cue. He wrote up a sort of plot outline broken into scenes, listing all the characters, props, costumes and sound requirements for that scene. This was pinned up backstage for all to see. It was also the bookkeeper’s responsibility to obtain a license from the Master of Revels. The Office of the Master of the Revels made arrangements for all the queen’s entertainment, which often included private performances of plays. In fact, it was Edmund Tilney (the master of the revels for most of Elizabeth’s reign) who formed The Queen’s Men. 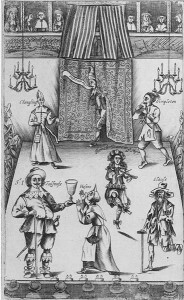 But this role was expanded after 1581 when a law was passed whereby all plays had to have a license from the Master of Revels before it could be performed. This early form of censorship ensured none of the plays were politically sensitive or could insight the public to think ill of its sovereign and her policies. Boy actors often began their career as apprentices to the lead actors. They performed the women’s roles and in turn got free board with the master who in effect hired them back to the company. Actors often moved between the companies unless they were one of the lead actors or shareholders. Some of the prominent actors of the time were Richard Tarleton, Edward Alleyn, Will Kemp, Richard and James Burbage. He was responsible for costumes which were the company’s biggest expense. The costumes often came from the nobility who no longer required last year’s fashions. He also took care of the props and the general back-stage management. Hired musicians played sackbuts (an instrument like a trombone) and drums. The Gatherer took the audience’s money on entry. You’d want someone you trusted doing this duty and might use one of the company’s sharers if they weren’t otherwise engaged. Here within this place at one of the clock shall be acted an excellent new comedy called _____ by the _____ Company. Successful plays had to be guarded closely because they might be stolen by a rival company. Putting them under lock and key didn’t always work, however. A play could be copied by someone sitting in the audience or by several spies piecing the bits together later. With no copyright law, this was not illegal. There’s evidence that about 30 different plays would be performed in a 6 month period by one company. With performances on 6 days of the week in the peak season, that’s a whopping 150 performances! A play had to be good to see a second night, and excellent to see a third. Popular themes for plays were historical figures, particularly from antiquity, girls dressed as boys, swapping identities, corrupt officials and the odd mad ruler. Whether a comedy or tragedy or something in between, all plays ended with the clown dancing a jig. A player’s day began at 8am with rehearsal. If there were any last-minute changes the bookkeeper let the players know then. They rehearsed for a few hours until dinner at noon. Over dinner they might discuss the upcoming performance or a new play. After dinner, at about 1 or 2pm, the performance began. It went for about 2 hours. There might be a few hours for relaxation (or cleaning costumes and tidying the tiring house for the tiring house manager) and then it might be time to prepare for a private performance for the company’s patron or for law students at the inns of court. This would involve packing up costumes and props and loading them onto a barge to go down river or on a cart if travelling by road. The life of a player was hard work but I bet they had a lot of fun.